You’ve probably heard about the giant dead zones that expand and take shape every summer in the Gulf of Mexico and the Chesapeake Bay, driving away fish and wildlife and leaving miles of barren, underwater deserts in their wake. You may also know that one of the biggest causes of these dead zones is runoff polluted with excess farm nutrients from both synthetic fertilizer and big livestock facilities. Now, toxic algae, the dead zone’s evil twin, and another product of too much nitrogen and phosphorous coming from farmland, is vying for equal attention. According to a new report released yesterday from the National Wildlife Federation and Resource Media (including this helpful interactive map), lakes and rivers in 21 states saw severe cases of toxic algae blooms in 2013. In other words, in those states, there was enough green slime to result in warning signs and lakes that were closed to the public. It’s also worth noting that the authors of the report believe that the dangerous bacteria is probably present in many more places than have been recorded. In New York, one of a small number of states that monitor the algae closely, for instance, scientists have found 50 cases of toxic algae in lakes and waterways. 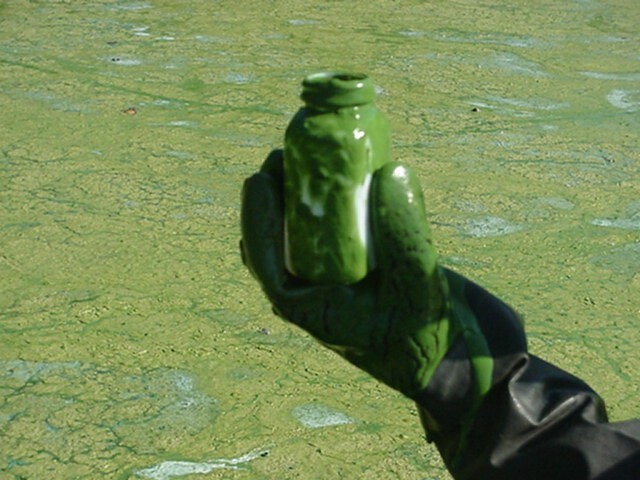 When this algae “blooms,” it covers lakes and rivers with a stinky layer of what looks like green paint spilled across the surface of the water. The algae is caused by something called cyanobacteria, which can produce multiple types of toxins, including a group known as microcystins. According to the World Health Organization (WHO), these toxins can make people sick and kill animals. Kentucky officials found toxic algae at four lakes, which collectively draw more than five million people a year. Visitors to the lakes have complained of rashes and stomach problems. In the Klamath River Basin, near the Oregon-California border, where indigenous tribes depend on salmon and mussels, microcystin levels have been recorded far above WHO health standards and are feared to be bioaccumulating in the livers of the tribespeople there. In 2010, microcystin washed from a lake in Central California into Monterey Bay, where it poisoned sea otters. This is the second year that Resource Media has tracked these algae outbreaks, and one thing is clear: We’re still far from a solution. Thanks to ethanol demand, corn is still being planted on every sliver of land farmers can find (two million acres of marginal land has been planted with corn in recent years). Using loads of fertilizer is often seen as the best way to guarantee a high yield, but it turns out that corn plants can only actually absorb a paltry amount of the nutrients (less than 35 percent). Add to this the fact that many farmers apply fertilizer to bare field in the fall, where it can easily be washed into rivers and lakes when it rains and snows, and you have a recipe for a lot more toxic algae stew over the next few years. While consumers can definitely play a role in supporting organic growers and other farms that use soil-boosting practices, this isn’t a problem any of us can buy our way out of. Clean water laws and farm policy are crucial to controlling toxic algae, as well as dead zones, and nitrate pollution in drinking water (another environmental doozy caused by the same pollutants). Historically, federal conservation programs funded through the Farm Bill pay farmers to preserve and create wetlands and other similar buffers that trap the nutrients before they run off into streams and rivers. But the version of the Farm Bill that is being debated in Washington this month proposes deep cuts to these program; and it’s looking like the bill may stall out before the current one expires anyway. The report also offers several other policy recommendations (PDF), including the re-authorization of a bipartisan bill, which was developed in 1998 specifically to combat algae blooms and dead zones. But it’s hard to say how high algae will rank on most lawmakers’ lists. In the meantime, however, an uptick in public awareness about the role our food system plays in what might otherwise seem like an unrelated series of green slime outbreaks and the link to other, similar environmental crises, might just be an important step on its own.